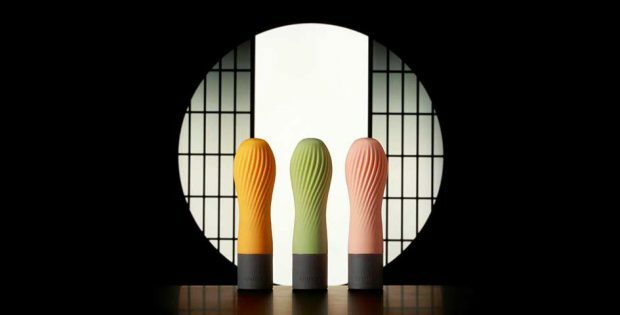 iroha zen is a new series of vibrators from the iroha brand. For the first time, iroha’s unique Soft-touch silicone is available in a battery-powered item. Rows of pleats adorn the outer silicone, covering the soft inner layer. The long shape is easy to hold, and the item is fully waterproof up to 50cm. It also features iroha’s dust-proof coating to help keep it clean. The zen requires 2 AAA batteries (tester batteries included). The shape is inspired by the chasen, a bamboo whisk used to in making traditional Japanese matcha tea. The three item colors are named after teas: Hanacha (floral tea), Matcha (powerded green tea) and Yuzucha (citrus tea). the iroha zen has a suggested retail price of 40 Euro and will be available in early 2018.